Born and brought up in Orkney, Eileen Sclater studied Graphic Design and Photography at Edinburgh College of Art, graduating in 1979. Jobs followed as a designer in Edinburgh with W & R Chambers, The National Trust for Scotland and John Bartholomew & Son Ltd and, in Fife, Crombie Anderson Associates. 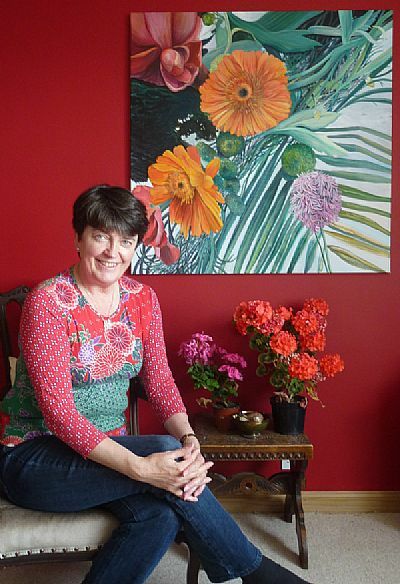 Moving overseas in 1988 with her husband, a civil engineer, she freelanced in graphics and returned to painting during her first posting to Qatar, taking part in many group shows in Doha. Postings to Romania, Pakistan and Russia followed with her two young daughters so painting went on hold as travel took over. Returning to Orkney to settle in 2006, she now has a studio in her home in Stenness with clear sea views over Hoy Sound. She exhibits regularly (go to her 'News' section to find out where and when) and undertakes commission work once more.